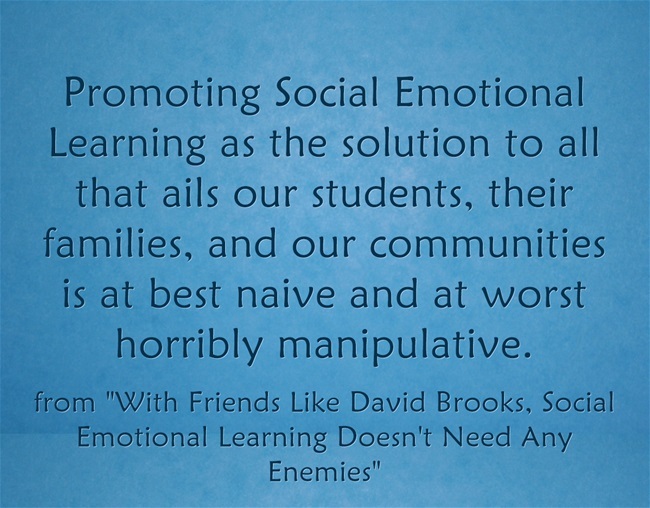 New York Times columnist David Brooks is at it again, demonstrating the rapidly growing public face of Social Emotional Learning as a “Let Them Eat Character” strategy (which I wrote about in The Washington Post — The manipulation of Social Emotional Learning). 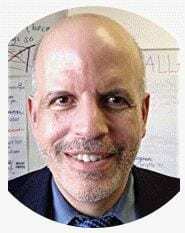 His column today, The Character Factory, quickly dismisses the effectiveness of programs that provide economic assistance to low-income people because “they have produced disappointing results.” Of course, he provides no evidence or details for that critique. Perhaps he should actually talk to a low-income person now-and-then who has benefited from food stamps, rental and home-buyer assistance, the Earned Income Tax Credit, Medicaid, etc. And he doesn’t consider the possibility that those programs might be even more beneficial if they were better funded. This is the kind of critique that comes from someone who has never needed that kind of assistance. Then, he launches into a paean to the need for poor people to have character — that’s the ticket! They just need a little grit, self-control, models (he calls for a “Boomercorps” of volunteers to provide them), good habits (to his credit, he does throw a bread crumb at “opportunity” by mentioning that it would be important for college to be affordable). No wonder there is a growing backlash against Social Emotional Learning by those who see it being co opted as a low-cost way by many conservatives to avoid providing adequate economic support to schools and as an excuse to avoid discussion of income and wealth inequity. 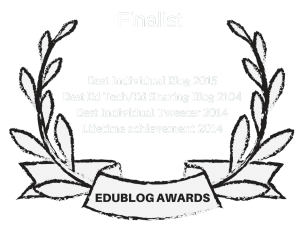 I’m a big supporter of teaching Social Emotional Learning skills. In fact, I’m just completing my third book on the subject. But in my teaching and in my writing (even more so in this third book), I recognize that my students have many challenges ahead of them, and that SEL is one small (though important) piece of the puzzle. Promoting them as the solution to all that ails our students, their families, and our communities is at best naive and at worst horribly manipulative. At it’s very worst, it could also be called neocolonialist or educational colonialism. As far as I can tell, David Brooks has never written a coherent column on anything related to education. Oh, well. At least The Times has Paul Krguman….. I don’t know anything about US columnists, in fact I am an Italian teacher, but I teach in a low-income area and I 100% agree with you: why don’t we scream that money is the difference, that money is the OPPORTUNITY, that accessibility to good education is the key to future? Why everybody seem to not understand that in schools miracles don’t occur, and if societies are so economically unjust, we in low-no-income areas fight everyday against inequality. Our students love us because we create emotional learning experiences, since …. we are low-income worker, too! Disclosure: I’m new at teaching and understanding SEL. When exploring SEL, I get why it’s necessary, but of course do not believe it will solve “all that ails…” I’m a big advocate for mental health and have first hand experience growing up with an emotionally imbalanced parent. I think I would have been a better student (better focused) if I understood that emotional problems are not unique, but in our society, our homes, even our own heads. I believe learning to accept and learn how to deal with emotional problems (instead of being in denial about it) frees up thinking-space for core curriculum.